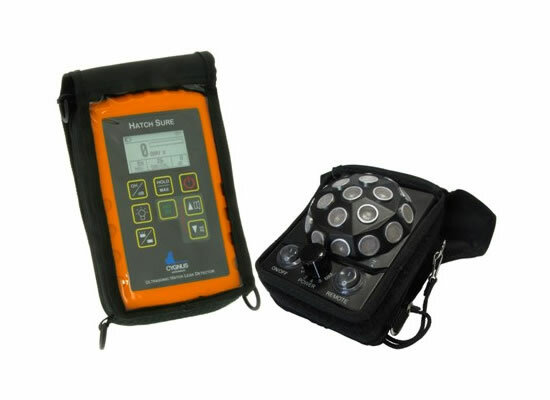 Cygnus Hatch Sure is an ultrasonic leak detector able to perform a quick and effective evaluation of cargo hold hatch covers and door seals to determine water leaks and weather tightness. Test the weather tightness of cargo hatch covers or doors. Hatch Sure receiver with protective case, 2 rechargeable batteries for the receiver, neck and waist strap for the receiver, telescopic extension and cable, 2 flexible inspection microphones, protective foam cover for inspection microphone, headphone 2-into-1 splitter cable, neck-band headphones, Hatch Sure transmitter with protective case, shoulder strap for the transmitter, 2 sets of 6 rechargeable batteries for the transmitter, fast charger for the rechargeable batteries, external DC power lead for the transmitter, emergency microphone cable, rucksack style carry case and operation manual.